In-jokes are for the in crowd, and if you’re out, you’ll click uncomprehendingly past the wunderground.com’s very name, wilfully cute shorthand for Weather Underground, and its in-plain-sight harkening to the 60s radical group by that very name. They’re based in San Francisco, you see, where such allusions are knowingly received; but history aside, wunderground.com backlogs all kinds of information about things meteorological, and that doesn’t sound too subversive, does it? Call me a naïf, then, but I’m not mine-sweeping the data for clandestine, coded hints to the cadre; I’m prepared to believe it’s actual weather data you’re looking at. Type in a place name, click submit, and follow by clicking the Custom tab, whereupon you can enter from/to date endpoints (N.B. 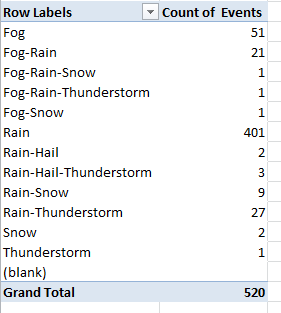 – these can be no more than 400 days apart; if you want two years of weather history, then, you’ll need to issue two Custom requests and airlift the results into one sheet, one set atop the other). Click the one of the two Comma Delimited File links at the base of the results (no; I can’t explain the need for two).The data appear in a new window in bare CSV form, and must be copied, pasted and then subjected to a painless Text to Columns routine (the separator, here: comma. Remember as well to delete the presumptive header row from the second paste, (see the January 17 post for review) shimmed smack dab in the middle of all the pasted data, if you’ve called up two years of records). I see a few problems here darting between the drops. I’ve ordered 731 days of weather from wunderground (remember, 2012 was a leap year), and I’ve come away with only 520 of them. That’s what happens when 211 blanks dilute the data, and we need to ask who invited these nullities to the party. An unpopulated Events cell could communicate one of two very different things: simple data truancy, i.e., a bit of AWOL information about the day, or rather a merely quiet day – that is, one in which no recordable “event” happened in Manchester. The difference is most material; dividing 401 rain days by 520 usable days, or by 731 of them instead clearly matters; and given the profuse but unsystematic distribution of the blanks I’d opt for the latter take, that is, that the blank-bearing days were simply deemed uneventful. Going to Manchester? Bring your umbrella. A run-through of similarly time-framed data for London – no slouch in the rain department, itself – ran up a rain quotient of 47.81%. Next problem. Manchester’s Precipitationmm field (the mm presumably abbreviates millimeters) serves up an unrelieved medley of zeros, one for each and every day, among the data, and that can’t be right (the London data does carry this information, by way of contrast). That’s a clear data imperfection, in need of follow-up (I’ve awaiting an e-mail reply from wunderground on the two problems). 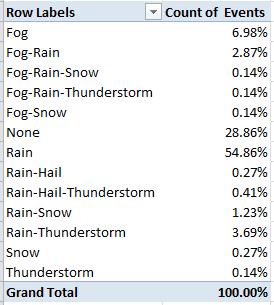 Values: Rain (Again, Count and % of Column). Make that an umbrella and a raincoat. The comparable figure for London, circa 2011-12: 52.05%. Paris? 43.23%. Er, Honolulu? 45.69%. Surprised at that last number? Me too. So is the Manchester Chamber of Commerce. Pleasantly.